My lastest kindness mission was the biggest one yet, and definitely the most fun. 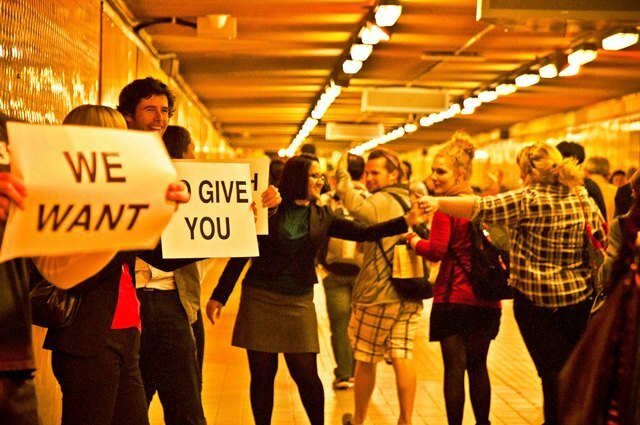 I called on some Kindness Army Recruits – Agents A, C, J, K and S – and inspired by Improv Everywhere we gave out free high fives to passers by at Central Train Station. Central is one of Sydney’s busiest train stations and this mission took place during peak hour on a week day in one of the main tunnels leading to the platforms. Five of us stood next to one side of the tunnel holding signs reading: “We want” “To give you” “A high five” “Get ready” and the fifth person gave out the high fives. We all took turns being the high-fiver because this was by far the most fun! Most of the commuters were coming home from work looking fairly tired and fed up, or just lost in their own little bubble and totally disconnected from everything around them. When they spotted our first sign they looked a bit confused, and then as they read the other signs many of them began to smile, take out their headphones, put away their iphones in preparation for the high five. Some of them even commented “Awesome!” “Wow, that’s great!” There were very few people who refused to give a high five, and out of the hundreds of people that took part, only two asked, “Why are you doing this?” The answer “Just because” seemed to confuse them even more. Not for money or advertising or anything?? Crazy. Thankyou to the awesome Kindness Agents who helped make this mission possible, and to the recipients who jumped on board so joyfully. And to all you other lovely Kindness Recruits, go give someone a high-five “just because”! Thanks Eric! Big high five right back at ya! Love it! Great idea and well done to everyone involved. Who knows what the knock on effects were for people’s evenings after that? You could have touched hundreds of people indirectly too! Thanks, Steve. Yes, I have a feeling they would all go home and tell someone about the experience. So hopefully quite a few more people got a smile out of it too without us being aware of it. Last summer while hiking through the heart of Santiago, I ran into some college kids spending the afternoon of their winter break giving away free hugs, or “abrazos gratis.” They could have been home playing video games, or watching TV, but like you, they were on a mission. What an evening! That’s awesome, Cameron! I love to think of all the people around the world on missions to spread happiness! It’s really pretty amazing. If only such things were considered newsworthy. Thanks for sharing! May I ask if the reactions were somehow related to certain age groups? Oh, enermazing, of course there is hope! Tonnes and tonnes of it. People are so hungry for happy moments its ridiculous. I asked because some years ago when I was working at a shop I stood outside and just smiled at people passing by. Of the age group (guessed) 45 to 55 there were many more who turned their head and ignored me than younger and older ones who smiled back. At the time I thought maybe they worried I’d drag them into the shop, but then again, why weren’t the younger and older ones? A high five to all of you for finding such a fun way to brighten people’s day! Thanks Paprika! High five to you too! This made my day! I wish some random person would give me a high five! It’s amazing what a little positive physical contact can do to improve someone’s day. It doesn’t take much to bring people back out of their bubbles and reconnected with others around them. Great job, Cat and your amazing Kindness Agents. Keep up the inspiring work! 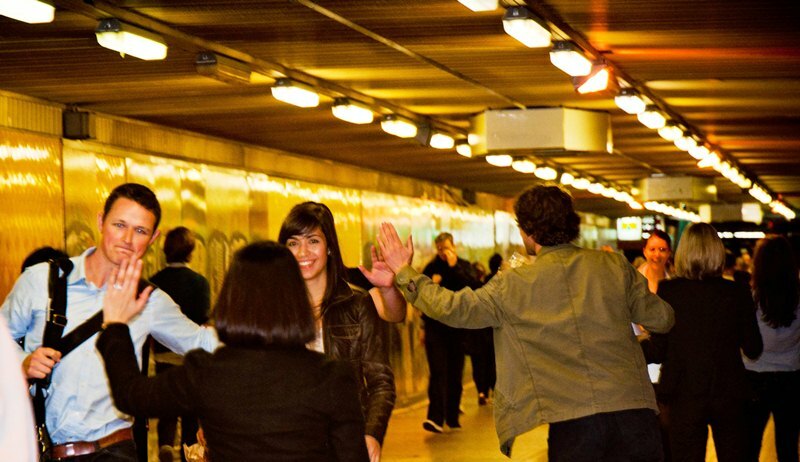 Awww well, yknow you could always be the random high five person yourself! I thoroughly recommend it to restore faith in the goodness of people and boost general happiness levels for at least a week. It was absolutely amazing to see people’s response to something which is so silly when you think about it – slapping your palm against theirs (our hands were all pretty sore afterwards!). A high five to all from me…Kindness a great remedy for our world! Thanks, Roberta, I definitely agree – the best remedy there is! #1 I love Improv Everywhere! Hunny and I love almost all of their videos. #2 High fives are the best!! Great job Kindness Recruits! I love the reactions of the people receiving their high five. Pure Awesomeness. I love them too! They are beyond awesome! And yeah, the reactions were pretty great. That is so cute! High fives are so silly and uplifting at the same time, and I think having the series of signs prepares people for it so they are in a more receptive state. Yes, you’re totally right, the signs make all the difference in those situations. We were discussing how differently people would have responded if it was just one person standing there and saying “free high five?” as people walked by. Wouldn’t have worked at all! Love it! Love it! Love it! Lady, you don’t disappoint. Awesome!! Don’t know how you found my blog but do glad you did and that you enjoyed the high high five!